With the current wikileak driven DDOS attacks I thought I'd have a closer look at the tool being used to conduct the attack. 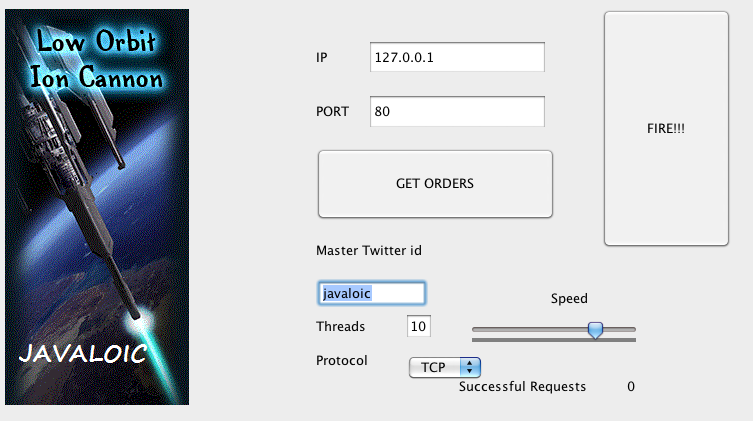 The tool that is being distributed if you wish to partake in the attack (and no that is not an invitation or endorsement) is an application called javaLOIC a Java port of Low Orbit Ion Cannon. A tool that can be used to test a site's resilience to DOS attacks. But obviously if you point it at someone else's the effect can be quite damaging. To be honest there isn't really much to the application. A pretty screen with some buttons to press and a flood module that crafts some packets to send to the target to deal with. You enter the twitter ID that has been communicated to you and then once you enter it on the screen you click the "Get Orders" button and when ready you click the "Fire!!" button. Other than that there isn't really that much to the application. So in essence it is a whole bunch of people requesting a resource that is not available on the server. When you get enough people doing this, something has to give. In this case the web sites of the targets. If they have an IPS in place it may be as simple as looking for the above string to help slow the attack and keep the site up. The twitter angle in this application piqued my interest, it is using the twitter API in a new and creative way, certainly one that hadn't readily occurred to me. However, I guess easy enough for twitter to deal with, but then it likely becomes a game of "wack-a-mole" of find the evil twitter account being used this time round. A Java Script version of LOIC is also being used (thanks Jeff). As you can see from the screen shot it comes pre targeted, in this case paypal. There is also a mobile version which doesn't look as pretty and is currently not pre-targeted and uses the same http requests. From the code it does a HTTP request from the target site and has some elements in the code as to not adversely affect the browser being used. Target changes are communicated via the IRC channel to participants. From the looks of it the code could easily be modified to "autofire" rather than require a user to chose to participate.